Keep it cheap and simple. Ultralight backpacking is about simplicity: a little can go a long way! Last minute gift? Or a person in your life that’s just impossible to get a gift for? No worries if that a person loves the outdoors, it’s almost certain that they will find a bunch of great stuff at REI. And of course it’s backed by REI’s legendary return policy at tons of stores across the country. So take the stress out gift buying and give an REI Gift Card. $29.99 – Charges cell phones, tracking devices, cameras, etc. Keeping your backcountry electronics alive keeps you safe. This perfectly sized battery pack charges most cell phoned twice! And there is no need to carry any cables. The Jackery Bolt comes with two built in cables, 1) a Lightening cable for Apple products, and 2) a micro-USB cable for everything else. What’s more, this battery charges products faster than most competition with a 2.7A combined output. And is one of the lighter USB batteries around, making it perfect for most backpackers for up to a week in the wild! Weight just over an ounce, this knife is lightweight, but exceptionally functional with a full 2″ long blade. While there are lighter knives, if you’re going to carry a knife into the woods, you may as well be able to cut salami and cheese with it! This knife gets the job done in a lightweight, no-frills, locking folding frame. Amazingly, at a scant 0.7 ounces this knife does well at many backcountry tasks. The scissors are hands down their best feature cutting medical tape and gauze, opening food bags, and cutting fingernails etc. with ease. The blade while small, will cut cord and food that is not too large. And the file has a useful flat-blade screwdriver at its tip that we’ve also used on phillips head screws. These little day packs are great! And at 10 ounces they are refreshingly light in an era where many “daypacks” are approaching the weight of backpacking backpacks. They hold just the right amount for a day and don’t have too many bells and whistles that make other packs too heavy. The simple drawstring design on the 18 L has been with us for years, because it has proven itself to be perfect for just about any day-long mission. Pick the 18 L version if you are a minimalist or the 22 L version if you like a bit more room. You cant’ go wrong either way. A headlamp that’s $30 that’s still bright enough to hike difficult trails at night. Dimmed it’s perfect for weeks and weeks of camp use. But run it on high power and you have all the safety and security that comes with having a reliable light source that shines a beam a long way for 30 hours—just in case you need to make that emergency exit! Weighing in at 2.9 oz with batteries, it’s one of the lightest night-travel-worthy headlamps on the market. Titanium is a backpacker’s best friend! Digging the last morsels out of the bottom of a bag of freeze dried food is challenging with most utensils. Enter SnowPeak’s long-handled titanium spoon. It can easily reach those faraway corners, providing you all the needed calories to keep you hiking. And unlike other long handled spoons that are hard to store this folds into a compact shape. It’s light at only 20 g (0.6 oz), and won’t put holes in freezer bags like a spork. A great deal for $20! A caffeinated backpacker is a happy backpacker! Enjoy your morning coffee with minimal weight penalty in this durable, lightweight, attractive titanium mug. A backpacker can never have too much titanium… or coffee. Compact and functional for only $12. Nope, its’ not the lightest backpacking stove on the market. But at 1/4 the cost of many mainstream stoves it’s a great value. Its narrower flame pattern is better suited to the smaller pots that lightweight backpackers prefer. It does well against the competition in mild conditions but gives up a bit of ground in fuel efficiency and heating times in more challenging conditions. Low cost titanium and the perfect companion to a lightweight stove like the Etekcity Ultralight Backpacking Stove, or MSR Pocket Rocket 2. This pot holds just over 3 cups, which is perfect for solo use (or for two people you can upgrade to the TOAKS Titanium 900ml D115mm Pot). Best of all it only weighs 3.6 ounces and has a compact easy to store shape. Titanium is nearly indestructable and non-reactive. This is my go-to hydration system. With the Squeeze, you can just fill up the bladder, and drink normally. Carrying heavy filters or waiting for chemical water treatments is more tiring, time consuming, and frustrating than your would realize if you haven’t yet used the Sawyer Squeeze. Its 0.1 micron filter removes all the nasties and yuckies that occur in water in North America (add chemical treatment to kill viruses in more exotic locations). What’s more, at only 3 oz, it’s likely to save you weight by allowing you to carry less water, and drink when you reach a stream. Finally the Sawyer Squeeze has lifetime warranty and almost unlimited capacity to treat water (assuming you back-flush when necessary). The Katadyn BeFree Collapsible Water Filter Bottle is an exciting newcomer to the lightweight, high flow rate, “squeeze style” water filtration systems. The BeFree is fast, filtering 1 liter in 30 seconds – so its far less tiring, time consuming, and frustrating than pump filters or chemical treatments. The BeFree is fairly unique in that it can be quickly unclogged without the need for back flushing. And it is light at 2.3 for both filter and water bottle. The BeFree bottle has a wider opening making it easier to fill than the narrow standard water bottle threads (but this also makes it less compatible with a lot of other optional gear that is based on standard water bottle threads). Like the Sawyer Squeeze, its 0.1 micron filter removes all the nasties and yuckies (bacteria and protozoa) that occur in water in North America (except for viruses). And the Katadyn BeFree saves weight by allowing you to carry less water, and drink when you reach a stream. We like the 1.0 liter version but the 20 oz version is great for storing on the pack shoulder straps. Note that the BeFree has a 1000 liter capacity (depending on water quality) vs. the Sawyer Squeeze filters almost unlimited capacity and lifetime warranty. An amazing deal on possibly the best clothing layer ever. A 100 wt fleece shirt is my go to favorite mid-layer—goes on every trip! For more see my “Top Mistakes Using the Layering System – How to Stay Warmer and Drier.” Sadly it appears that 100 wt fleece shirts like this are a dying breed so it’s best to buy one now. Hand down the best navigational too for the backcountry. Use your smartphone for navigation AND get 20% off! through my site. Using this app on my phone has completely supplanted standalone GPS units for me. Gaia GPS is the standard backcountry GPS navigation tool for iOS (Apple smartphones), and after a new release this year, it is fully capable on Android smartphones as well. Gaia allows loading of GPS data, tracking, and map loading for offline use with many different layers available (similar to Caltopo). This is perfect in conjunction with a caltopo.com subscription and did I mention the 20% off? Putting in stakes in rocky ground can be a challenge more often than we wish. Sadly, the light stakes provided with your tent are usually not up to the task. We recommend that you get some light but very strong ‘Y’ stakes. You can use a large rock to hammer these stakes over and over into some of the hardest and rockiest ground without bending. In addition, they have better holding power in loose ground than stakes provided with most tents. These TNH tent stakes have a notch on only one side making the head of the stake where you pound much stronger (a typical failure point with most stakes). And they come in easy to see, hard to lose red color and reflective cord so you can see them at night. This monocular is a great backcountry tool. We routinely carry it for route finding. And it’s great for wildlife spotting too. And while it’s inexpensive it will do a great job of scouting a route across the valley, or help you identify those white flecks on the shoulders of a Boreal Owl. At 2 oz. it’s light enough that you’ll want to take it with you! $23 and Super Sharp Photos for your Phone! This little tripod stand for smartphones is likely the lightest phone stand option available weighing in under 2 oz. Its three-foot design ensures maximum stability. It has a mount that fits a range of smartphone widths, and can tilt 36° in any direction. If you want an inexpensive, easy smartphone tripod solution, look no further! Couple this with a bluetooth remote camera shutter for maximum flexibility. Sometimes arm-length selfies just won’t do. When trying to take a picture with your phone far away, it’s a lot easier to use a remote shutter release than to set a timer, then run around like a crazy person trying to get in the frame on time. Set your phone up with a nice little tripod (above), position yourself properly, and hit the shutter when the time is right! When you need to take notes, this pen will work. Even if it’s bitterly cold, or wet, or you’re upside down. It’s solidly built and features a retractable tip and replaceable ink cartridges. And if you get lost, and accidentally wander onto a rocket, this pen will even work in space! Even if you’re not John Muir, it can be nice to keep a few trail notes. This paper won’t tear, won’t bleed, and won’t get soggy and rip in the rain. Write in the rain! This is perfectly paired with the Fischer Space Penabove for all-purpose, all-weather writing. Few tasks in cutting backpack weight are as instructive as weighing out all of the gear in your pack, and taking stock. This scale can handle weights up to 15 lbs and down to 1 g. Like everything in an ultralight backpacker’s kit, this piece of gear serves dual purpose. Use it to weigh your gear, or use it in the kitchen, making those delectable meals you need to sustain you on the trail. This face-sized packtowel is just right. It’s not too big so you never bother taking it with you, but it makes for a great multi-purpose backpacking tool for wiping condensation off of tent walls. It also works for drying face and hands, or drying pots. Since these towels are easy to wring out, you could even use it to dry off after a quick dip in an alpine lake. A hat that does most everything well! This hat is convertible between a lightweight running hat and a more serious expedition hat by allowing a neck shade to be attached to the hat. The neck shade can block sun and protect from bugs. It comes in light colors to better help deal with solar radiation, but other colors are available if you don’t like the bright white. This this is one of the most functional hats I’ve ever put on my head. These durable liner gloves come with electronic touch to help you interact with smartphones and other touchscreen devices without removing your warm gloves. They use abrasion-resistant Cordura, are lightweight, warm, and still stretch to fit your hands. They come in a variety of exciting colors, as well as tamer black or white options. You’ll likely never lose the neon yellow ones! These inexpensive gloves come with me on virtually every backpacking trip. I wear them around camp to stay warm while keeping dexterity for camp chores. These are lightweight, durable, and warm – everything you’d want from a glove! These are Smartwool’s smartest socks. They have a nice fit which they retain well even when wet and moving fast. They have good underfoot cushion, and seem to be fairly durable. If you’re moving fast, or running, the Run Elite Low Cut socks are difficult to beat. Socks are a more personal thing, and fit is important. These size quite differently than the Darn Tough socks, so be sure to check sizing charts! A simple, lightweight balaclava, this will keep your head and face warm against the cold. If it’s not super cold, you can roll it up to wear as a beanie. At 1.8 oz, it’s a lightweight way to keep your head and face warm. This beanie is just the thing if you aren’t into balaclavas. It keeps your noggin warm without overheating and has a nice cuff to keep your ears warm. Not too bulky it fits as nicely under hoods and is comfortable to wear. And of course it’s made of incredibly warm, soft and natural merino wool, that will last for years! These meals are some of the best on the market. They are hearty, healthy, and require only boiling water, perfect for those lightweight alcohol stoves we love to carry. The meals are made in Maine, and are totally delicious! Many are vegetarian, and the meals come in single serving or double serving sizes, to fit bigger trail appetites. Of course, these go well with the titanium long-handled spoon above! Pro Bar Meal bars are truly single-serving meals. They pack over 350 calories, 8-9 g protein, and plenty of fats and salts into a trim 3 oz package. These will keep you going! So why not get a few different flavors, and stuff the bottoms of those stockings, as well as a backpacker’s stomach? Not just for Girls! These lightweight, running shoe gaiters are perfect for keeping twigs, rocks, and dust out of your trail shoes. What’s more, they will keep your shoelaces from snagging on twigs and other detritus, leaving them tied snugly all day long! They come in a variety of bright, colorful, and imaginative colors and patterns, as well as plain options. They come with a kit to attach to any shoes, but several trail running shoes have built-in “gaiter traps” made to attach to these gaiters (e.g. Altra Superior 2.0 and Altra Lonepeak). Made by hand right here in the USA, Dirty Girl Gaiters are the perfect gift for the trail runner, backpacker, or hiker in your life! This stuff will fix just about anything. It’s perfect for stopping up holes in your tent, patching a tear in a rain jacket, or even keeping a wool shirt from unraveling. Duct tape is nice, but doesn’t work nearly as well in the woods. This stuff will keep your gear going, try as you might to beat it up. This diminutive tripod stands with the best. Sure, it’s not very tall, but it’s incredibly light at 2 oz, and it’ll hold your camera stable enough to capture gorgeous star shots at night! 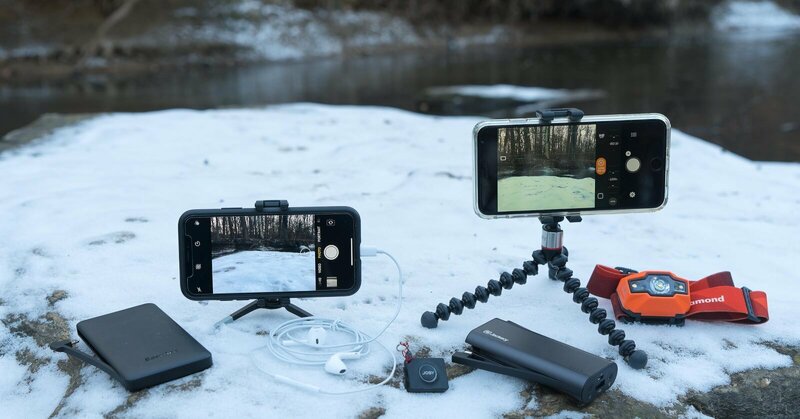 It’s also inexpensive, so if you need a tripod to get those good shots in the wilderness, but don’t want to break the bank or your back, this is a great option! This is also great in combination with smartphone holders like a Joby GripTight Mount to give your iPhone or Android Phone a solid mount for better selfies or low light photos.